Yanchi County Great Wall of China, location Coordinates: 37° 47′ 18.49″ North, 107° 24′ 15.67″ East. 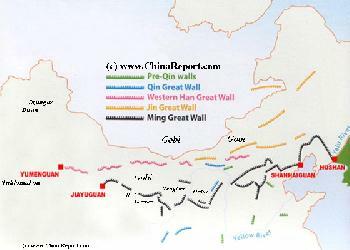 In Ningxia Hui Autonomous Region there are five sections of The Great Wall of China. The first of these is Yanchi County Great Wall of China. The others are from East to West Shuidonggou (Coordinates: 38° 16′ 43.09″ North, 106° 31′ 53.45″ East), Dawukou also known as Jiucai Gou (Coordinates: 39° 4′7.97″ North, 106° 21′ 14.52″ East), Sanguankou or Helan Pass (Coordinates: 38° 20′ 48.72″ North, 105° 49′ 23.74″ East) and Songwei or Zhongwei (Coordinates: 37° 31′ 8.21″ North, 105° 10′ 54.41″ East). Near Yanchi, just west of the Shaanxi Province Border and the Great Wall location of Dingbian, there are remnants of no less than three lines of The Great Wall to be visited. A First Line of defense was built during the Sui Dynasty (589 AD - 618 AD) some 1400 years ago. The two other sections in the vicinity are both constructed during the Ming Dynasty (1368 AD - 1644 AD) Era. The difference between the two was only recently discovered using Radar Remote Imagery. Yanchi County has a long history going back as early as the Spring and Autumn Period (722 BC to 481 BC) of the Zhou Dynasty. 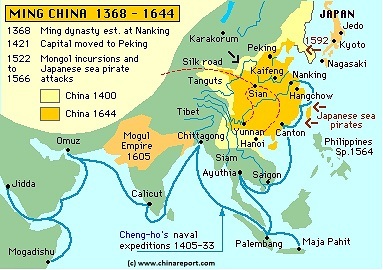 In the early years of the Reign of the Han Dynasty Yanchi was set up as a county. During the high-point of its operations in the Ming Dynasty Era the Ningxia Zhen (Garrison) was responsible for the Yanchi Section. Its jurisdiction for guarding the Great Wall ran from Yanchi in Eastern Ningxia to Jingyuan and Gaolan in North-Eastern Gansu Province. Headquarters of Ningxia Zhen were not at Dingbian but at a Central location at the present Yinchuan city at the Yellow River in Ningxia Hui Autonomous Region. Located due East of Yinchuan the Capital of Ningxia, Yanchi lies on the Ordos Desert plateaux in the transitional area of the Yellow River Basin Loess Plateaux and the north Maowusu desert. As such Yanchi is prone to the occurence of Sand storms. No less than 18 storms occur each year, mainly in the spring months. Yanchi itself is only a small village with a few shops and a museum honoring the revolutionary war years and those outstanding sons and daughters of Yanchi Village that lost their lives as Heroes in the war against Japan and the Nationalist Armies of Generalissimo Chiang Kai-Check (Jing Yieshi in Chinese). Although North-Shaanxi Province already had a modest Communist Base Area established, most of the local Martyrs were recruited after the Red Armies led by Mao Zedong and the Communist Party Central Committee started arriving in the Area after the end of their "Long March". The First Communist Troops arrived in October 1935 AD, and from then on many locals were recruited into a new and larger Force, supported by a "new" Base in North-Shaanxi Province. The recruits would breathe new Life into a decimated army. However, there was little rest after the end of the Long March, soon a new Battle, the 1st of many to come would be launched. Many of the Yanchi Martyrs would participate in "The Battle for Ningxia", a Military Campaign that would see much political maneuvering that would split the party, sabotage the battle plan and lead a large section of the Red Army (mainly elements of the 4Th and the Women's Corps) on another Final Death March. There would be few survivors. The Yanchi County Revolutionary Martyr Museum has an exhibition displaying portraits and deeds (as far as traceable) of 74 martyrs originating from Yanchi County, however says little about the controversial Ningxia Battle. Yanchi County has an average elevation of 1,600 meters and has no rivers nor any lakes. With an average annual rainfall of 300 mm, the ground is dry, sand and salted shoals make up 80% of the landscape, and mosyly - visitors will find themselves sourrounded by the sandy wind. Ningxia Hui's Capital of Yinchuan lies 130 km due West of Yanchi county town. The road East leads to Dingbian and from there on to either Xi'an or Jingbian and Yulin in Shaanxi Province. The Yanchi county measures roughly 110 km from north to south and 66 km from East to West and has a total area of 7,130 square kilometers. From the 11Th to 13Th Centuries the Xia Xia civilization reigned supreme for several centuries and left an abundance of historic remains, cultural relics and heritage. Among these are some rock carvings and inscriptions. The two major historic sections of The Great Wall of China are the local Sui Dynasty Great Wall and the nearby Ming Dynasty Great Wall, both running from west to east across the County. In the north of Yanchi County lies Castle 17 better known as Tongwancheng. This now abandonned site was once the capital of Daxia. The ruins of the walled city remains were constructed by the Xiongnu right on the border with Inner Mongolia in 419 BC. From a distance the fortress mound looks like a ship in the desert, making it a locally recognized site. Other must see sites are the Ling Temple Mountain Grottoes, Maiduo Shan Ming-Habitat and the Lake Fine ancient stone tools and cultural sites. A Full Google Earth Supported Map of Yanchi Great Wall by Google.com. 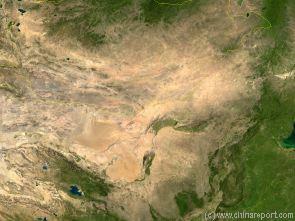 Adjacent Map gives direct access to Yanchi & Great Wall by Google Earth. Long Ago, the Western Xia (Xixia) were the contestors of the Han Dynasty in a lenghty struggle for control of Ningxia as well as the more Westernly Oasis, Settlements and Towns of what would not much later become the Silk Road land trading route. population counts the majority 123,000. Some 4,000 Ethnic Minority People are included in the rural population. As a long inhabited place, in a strategic location, no matter how remote today the Cultural heritage sites in the county are abundant. The are sites from the Han Dynasty and Ch'In Dynasty Era's. Then there is the Great Wall of the Sui Dynasty Era and related sites and further relics and monuments dating from the Tang, Song, Ming and Qing Dynasties. Other Cultures are also well represented at Yanchi.